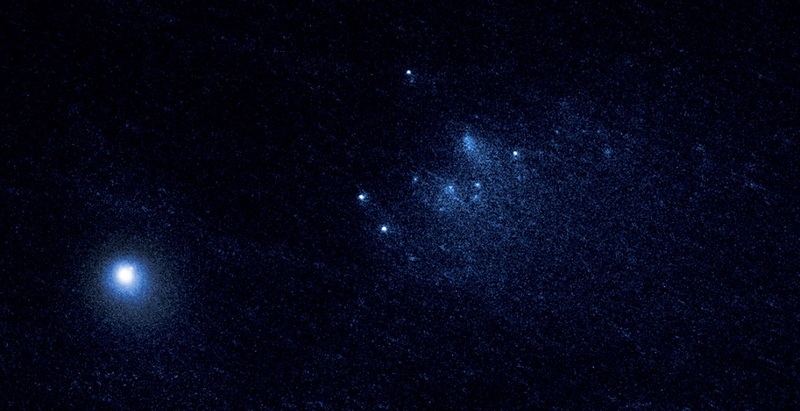 NASA's Hubble Space Telescope has captured one of the sharpest, most detailed observations of a comet breaking apart, which occurred 67 million miles from Earth. In a series of images taken over a three-day span in January 2016, Hubble revealed 25 building-size blocks made of a mixture of ice and dust that are drifting away from the comet at a leisurely pace, about the walking speed of an adult. The observations suggest that the roughly 4.5-billion-year-old comet, named 332P/Ikeya-Murakami, or Comet 332P, may be spinning so fast that material is ejected from its surface. The resulting debris is now scattered along a 3,000-mile-long trail, larger than the width of the continental U.S. These observations provide insight into the volatile behavior of comets as they approach the sun and begin to vaporize, unleashing dynamical forces. Comet 332P was 150 million miles from the sun, slightly beyond the orbit of Mars, when Hubble spotted the breakup. "We know that comets sometimes disintegrate, but we don't know much about why or how they come apart," explained lead researcher David Jewitt of the University of California at Los Angeles. "The trouble is that it happens quickly and without warning, and so we don't have much chance to get useful data. With Hubble's fantastic resolution, not only do we see really tiny, faint bits of the comet, but we can watch them change from day to day. And that has allowed us to make the best measurements ever obtained on such an object." The three-day observations reveal that the comet shards brighten and dim as icy patches on their surfaces rotate into and out of sunlight. Their shapes change, too, as they break apart. The icy relics comprise about 4 percent of the parent comet and range in size from roughly 65 feet wide to 200 feet wide. They are moving away from each other at a few miles per hour. The Hubble images show that the parent comet also changes brightness cyclically, completing a rotation every two to four hours. A visitor to the comet would see the sun rise and set in as little as an hour. The comet is also much smaller than astronomers thought, measuring only 1,600 feet across, about the length of five football fields. Comet 332P was discovered in November 2010, after it surged in brightness and was spotted by two Japanese amateur astronomers, Kaoru Ikeya and Shigeki Murakami. Based on the Hubble data, the research team suggests that sunlight heated up the comet, causing jets of gas and dust to erupt from its surface. Because the nucleus is so small, these jets act like rocket engines, spinning up the comet's rotation. The faster spin rate loosened chunks of material, which are drifting off into space. The research team calculated that the comet probably shed material over several months, between October and December 2015. Jewitt suggests that even some of the ejected pieces have themselves fallen to bits in a kind of cascading fragmentation. "Our analysis shows that the smaller fragments are not as abundant as one might expect based on the number of bigger chunks," he said. "This is suggestive that they're being depleted even in the few months since they were launched from the primary body. We think these little guys have a short lifetime." Hubble's sharp vision also spied a chunk of material close to the comet, which may be the first salvo of another outburst. The remnant from still another flare-up, which may have occurred in 2012, is also visible. The fragment may be as large as Comet 332P, suggesting the comet split in two. But the icy remnant wasn't spotted until Dec. 31, 2015, by the Pan-STARRS (Panoramic Survey Telescope and Rapid Response System) telescope in Hawaii, in work supported by the Near-Earth Object Observations program in NASA's Planetary Defense Coordination Office. That discovery prompted Jewitt and colleagues to request Hubble time to look at the comet in detail. Around the same time, astronomers around the world began to notice a cloudy patch of material near the comet, which Hubble later resolved into the 25 pieces. "In the past, astronomers thought that comets die when they are warmed by sunlight, causing their ices to simply vaporize away," Jewitt said. "Either nothing would be left over or there would be a dead hulk of material where an active comet used to be. But it's starting to look like fragmentation may be more important. In Comet 332P we may be seeing a comet fragmenting itself into oblivion." "Hubble's best previous glimpse at a fragmenting comet came during Advanced Camera for Surveys (ACS) observations of 73P/Schwassmann-Wachmann 3 (73P) in April 2006," said collaborator Harold Weaver of the Johns Hopkins University Applied Physics Laboratory in Laurel, Maryland. "In those observations, Hubble witnessed a comet with more than 60 named pieces. The Hubble images showed unprecedented detail of 73P's breakup, but the comet wasn't observed long enough to document the evolution of the fragments over time, unlike the case of 332P." The researchers estimate that Comet 332P contains enough mass to endure another 25 outbursts. "If the comet has an episode every six years, the equivalent of one orbit around the sun, then it will be gone in 150 years," Jewitt said. "It's the blink of an eye, astronomically speaking. The trip to the inner solar system has doomed it." The icy visitor hails from the Kuiper Belt, a vast swarm of objects at the outskirts of our solar system. These icy relics are the leftover building blocks from our solar system's construction. After nearly 4.5 billion years in this icy deep freeze, chaotic gravitational perturbations from Neptune kicked Comet 332P out of the Kuiper Belt. As the comet traveled across the solar system, it was deflected by the planets, like a ball bouncing around in a pinball machine, until Jupiter's gravity set its current orbit. Jewitt estimates that a comet from the Kuiper Belt gets tossed into the inner solar system every 40 to 100 years. The results will appear in the Sept. 15, 2016, issue of The Astrophysical Journal Letters. Comet 332P/Ikey-Murakami is an example of the chipping away of a comet by the force transmitted or conducted through its surrounding intimate atmosphere (halo) from asymmetric space densities to its more solid body parts. That is, as the comet traverses space it encounters density variations. These varying strata of space cause uneven fluctuations (density waves) in the comet’s atmosphere that impinge upon and stress the comet body. Depending upon the severity of these vibrations, the comet can fissure and crumble, which can also increase outgassing. If the object has little or not rotation, these loosened parts can stay more or less in close proximity, as described by Scheeres and Hirabayashi. In those cases when the object is approaching a gravitating source the density of space becomes more stratified or pocketed, as near planets. This effect becomes much more amplified near a star, in this case 332P’s approach to the Sun. Plus the usual solar winds and radiation contribute their effects. Pounding vibrations and internal tremors to 332P have loos-ened huge chunks, as seen in this image by Jewitt, et al. In this scenario the comet has a slow rotation; one sufficient to allow these destabilized parts to slowly drift away. This (unnamed) mechanism or process favors the undoing or separating from the main body of the comet of larger segments over smaller pieces. If the comet were spinning faster, we might expect the loose debris to be scattered more evenly. The concentration of fragments as in this case indi-cates a large amount departed more or less intact and has since begun to scatter. This loss of masses of material prompted by the rattling of the comet by exterior forces can be expected to continue and to increase as it draws closer to the Sun. Surviving that encounter and sailing outwards to the far reaches of the solar system 332P can expect a calmer voyage, but will never be completely free of those disturbing tremors.